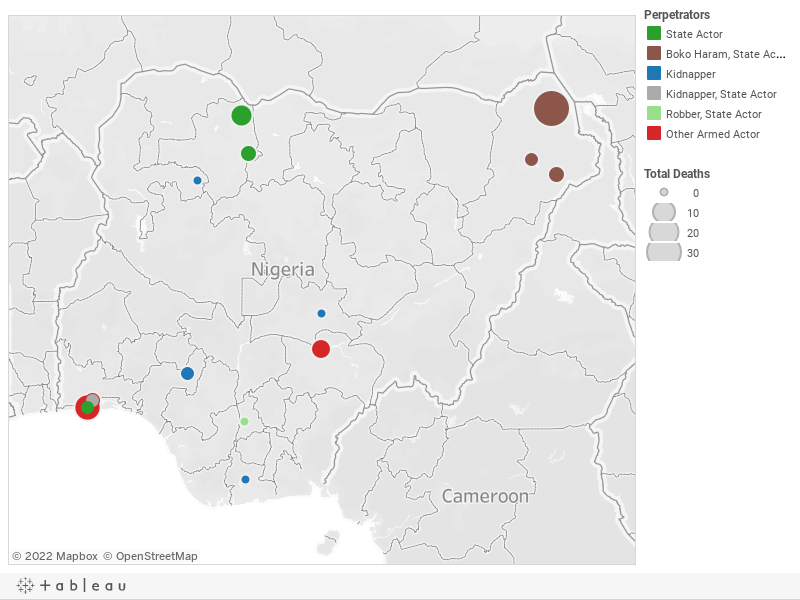 Below is a visualization and description of some of the most significant incidents of political violence in Nigeria from December 8 to 14, 2018. This update also represents violence related to Boko Haram in Cameroon, Chad, and Niger. These incidents will be included in the Nigeria Security Tracker. December 8: Boko Haram killed two soldiers in Bama, Borno. December 8: Four were killed in a cult clash in Lagos State. December 10: Rival gangs killed three civilians and lost four of their own in Lagos State. December 10: A cult clash resulted in four deaths in Makurdi, Benue. December 11: Gunmen abducted eighteen passengers from a bus in Emohua, Rivers. December 12: Police killed a would-be suicide bomber before she could detonate in Maiduguri, Borno. Boko Haram was suspected. December 13: Nigerian troops killed two bandits in Chafe LGA and six bandits in Zurmi LGA in Zamfara. December 14: Boko Haram killed twelve soldiers in Kukawa, Borno.